The history of Gran Paradiso National Park is linked to the protection of the ibex. In 1856 King Vittorio Emanuele II declared these mountains a royal hunting reserve, thus saving the ibex from extinction. Its population in those days had been reduced to an alarmingly low level. The king set up a corps of specialized guards and ordered the paths and mule-tracks to be laid down, which today are still the best network path system for the protection of the fauna by the modern rangers and form the nucleus of the nature trails for tourist excursions. In 1919, King Vittorio Emanuele III declared his intention to donate the 2100 hectares of the hunting reserve to the Italian State, for the creation of a national park. On 3rd December 1922 the Gran Paradiso National Park was established, Italy's first national park. Until 1934 the protected area was run by a commission with full administrative autonomy. These were positive years for the park: the ibex population increased considerably and the 340 kilometres of royal mule-track were restored. In the same period, however, there was a reduction of the original borders and major hydroelectric works were carried out in Valle Orco. In the years that followed the protected area was run directly by the Ministry of Agriculture and Forestry, they were the worst in the park's history: the local guards were laid off, the park was the scene of military manoeuvres, then the second world war started. All these actions contributed to the reduction of the ibex population to just 416 by 1945. 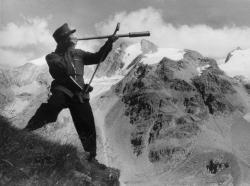 It is only thanks to the tenacity and commitment of the Commissario Straordinario Renzo Videsott that the fortunes of the park changed and the ibex was saved from extinction: in fact, by the De Nicola order, the management of the park was entrusted to an independent authority on 5th August 1947. The 1960's and 70's were a time of great conflict and misunderstanding between the park and local residents, who considered themselves excessively restricted by the protected area. Recently, people have begun to realize that the park can provide an opportunity for development and a boost for the economy of the valleys and, today, local authorities work closely with the park on several projects. In the meantime, Gran Paradiso set up a close and profitable collaboration with the nearby French park, Vanoise, in an attempt to establish a large European protected area. The park has been the object, of particular attention for scientific research since the post-war years. In fact, the first studies published in the scientific journal of the park began to appear in the 1950's. These studies were carried out by researchers of the University of Turin. They consist of research on the fauna, the physiology of the hibernation of the marmot, the geological history of the ibex, the feeding habits of the fox and the flora present in the protected area. The studies published on the anatomy and the pathology of the ibex and of the chamois are particularly rich, certainly due to the influence of the then director Renzo Videsott, veterinarian and free-lance professor at the Faculty of Veterinary Medicine of Turin.